A pub in the centre of Crouch End, part of the Mitchells & Butlers Castle sub-chain. 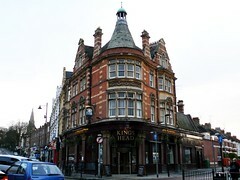 There are plenty of places to drink in this up-market area of town, and the Kings Head is certainly popular enough with the locals. At 8pm on a weekday evening most of the tables are taken and the place resounds loudly, though some people head off downstairs when the comedy gets going. It's nicely appointed inside, with a number of different areas to sit, such as a red velvet banquette area with subdued lighting, or another near the windows at the back, surrounded by chain curtains. The bar itself features a wide range of draught beers. There are four handpumps, and on an August 2008 visit one was off and the others had London Pride, Hydes Bells & Whistles, and Old Rosie cider. Lagers include Staropramen, Amstel, Peroni, Budvar, Grolsch, Franziskaner, Hoegaarden, Leffe, Fruli, Aspall's and Addlestones. Food is served noon-10pm daily. The menu is the same as at other Metro Professionals pubs, with sharing dishes as well as larger plates. In August 2008, Ewan's 'veggie nicoise' salad had nice hummous with plenty of pitta, fresh leaf salad and marinated peppers, though the aubergines were a bit tough and tasteless photo. Nothing particularly spectacular. Downstairs is a popular comedy club (with occasional live acoustic and jazz music). Listings can be found online. There's a pub quiz advertised every Wednesday at 8pm. Last visited by Ewan, Jo and others, 28 August 2008. Opening hours and food times taken from website, June 2009. Last edited 2013-06-06 12:36:26 (version 10; diff). List all versions. Page last edited 2013-06-06 12:36:26 (version 10).